← Chris Rock: Racism Almost Over? »»» For the latest on this living memorial to Bryan Guzman GO TO the Bryan House/Emmanuel House MAIN PAGE. —By GREGG CANFIELD, Chicago Tribune, 17 January 2008. Metro West, Sec. 2: 1, 5. To create a living legacy for a college student and musician who cared deeply about refugees, an Aurora organization has bought an apartment building where families split by war can reunite and get a solid toehold in this country. Relatives of Bryan Guzman, 21, who drowned in December 2006 off Chicago’s lakefront, are calling the building on Aurora’s west side Bryan House and see it as another step in lifting struggling families from the cycle of poverty. 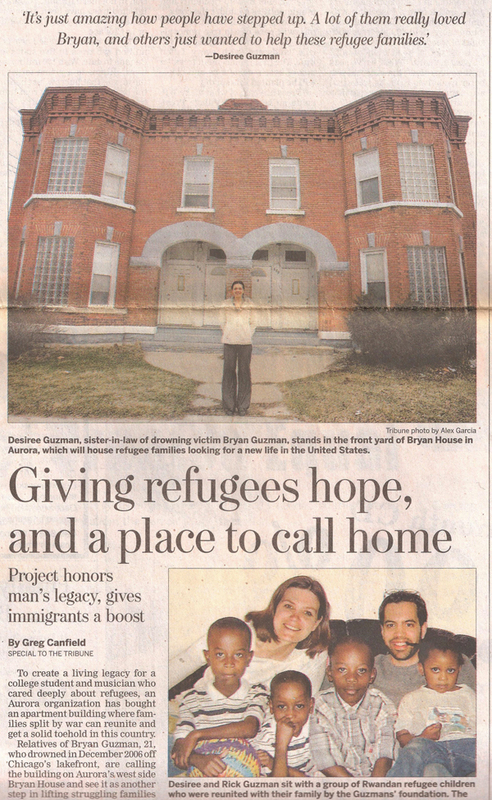 Guzman was active in the Tolbert Refugee Assistance Foundation, started in Aurora in 2002 by his brother Rick and sister-in-law Desiree. Working in cooperation with World Relief Organization, the foundation pays airfare for relatives of a refugee from a war-torn country to join him or her here. It also helps pay for car repairs and items food stamps won’t cover. The foundation bought the apartment building in December. It will house refugees rent free so they can set money aside in a savings account that may only be used to buy a home—ideally within a year. * Studies have shown home ownership is a key part of financial stability. Desiree and Rick Guzman know the model works. They housed a Cuban refugee family in their home for a year and put the rent they collected into an interest-bearing account. The family used that money to buy a home in July. Rent and building maintenance costs for Bryan House are being covered by sponsorships. A day of rent for one family costs $13. So far, four of the five units are fully sponsored for a year. Support from the North Central College community offered a big boost. Guzman was pursuing a major in sociology at the Naperville school, with a minor in music. His sister-in-law is assistance director of ministry and service at the college, his father, Richard, is a professor. North Central’s Union held a benefit concert Friday night that raised moe than $2,000 for Bryan House. Richard Guzman said his son would have loved being part of the show. Bryan performed in North Central’s jazz ensemble and played in bands with his brother Daniel and father. Playing benefit concerts was something he always enjoyed. As another tribute several of his fellow musicians recored a version of Jeff Buckley’s “Hallelujah.” The song can be downloaded for $1, which will be donated to Bryan House. More information on donations and sponsorships is available at www.bryanhouse.org. Desiree Guzman said Bryan House will only assist families World Reliuef has identified as quality candidates. For instance, the head of the household must be able to work. “We want to set them up for success,” she said. She and her husband estimate 100 refugee families can be sent on a parth to prosperity during the 30-year mortgage for Bryan House. But they don’t want to stop there. * A common misconception is that families live “rent free.” Families pay rent, but because of Bryan House’s supporters and the organization’s ability to maximize the effect of contributions, most of that rent can be invested. 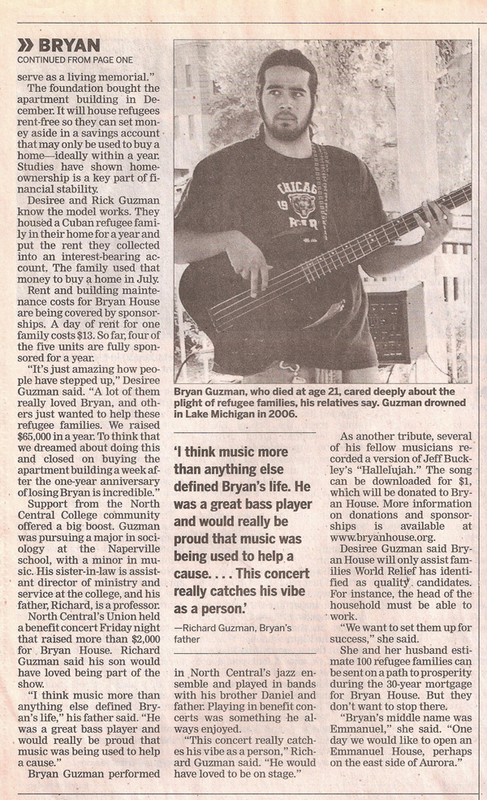 Below are images of how this article looked in the Tribune on January 17, 2008. This entry was posted in Family, Social Change and tagged Bryan Guzman, Bryan House, Chicago Tribune, Desiree Guzman, Emmanuel House, Gregg Canfield, North Central College, refugees, Richard Guzman, Rick Guzman, World Relief. Bookmark the permalink.